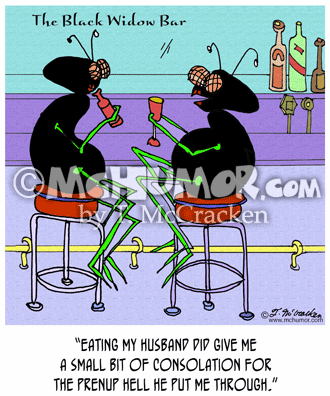 Prenup Cartoon 7891: A black widow spider saying, "Eating my husband did give me a small bit of consolation for the prenup Hell he put me through." 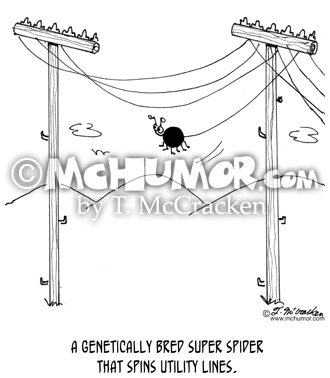 Spider Cartoon 6177: "A genetically bred super spider that spins utility lines. "A huge spider swings from one utility pole to another. 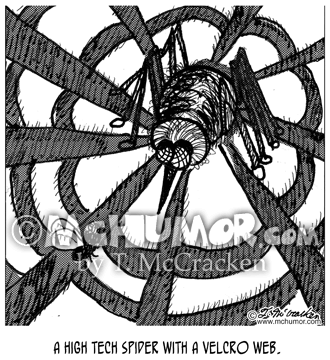 Spider Cartoon 2046: "A high tech spider with a Velcro web. 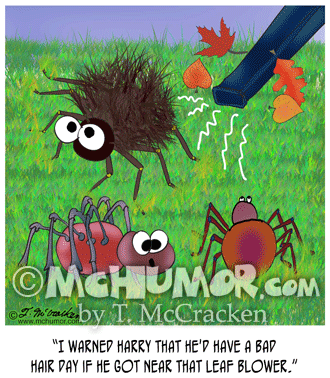 Spider Cartoon 8747: A spider says of another with really fuzzy hair standing on end, "I warned Harry that he'd have a bad hair day if he got near that leaf blower." 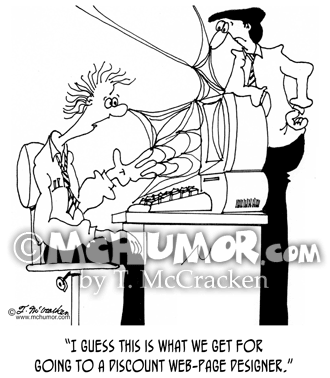 Software Cartoon 6821: A man looking at a computer covered in a web saying, "I guess this is what we get for going to a discount web-page designer." 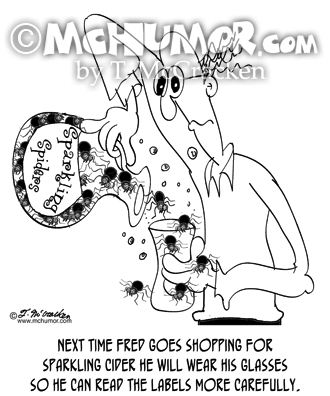 Spider Cartoon 8604: "Next time Fred goes shopping for Sparkling Cider he will wear his glasses so he can read the labels more carefully." 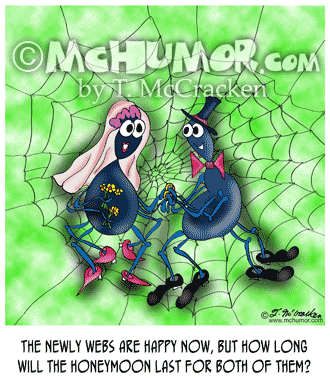 A man pours spiders from a jug of "Sparkling Spiders"
Spider Cartoons 8806: A spider bride and groom. 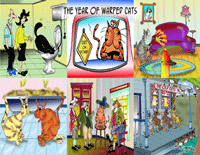 "The newly webs are happy now, but how long will the honeymoon last for both of them?" 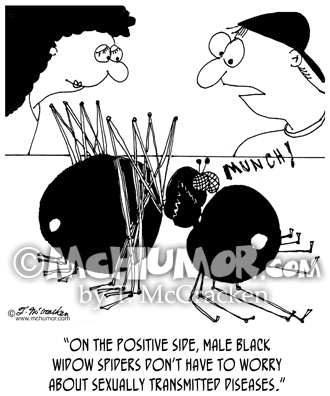 Spider Cartoon 7446: Someone watching a black widow eating her mate saying, "On the positive side, male black widow spiders don't have to worry about sexually transmitted diseases." 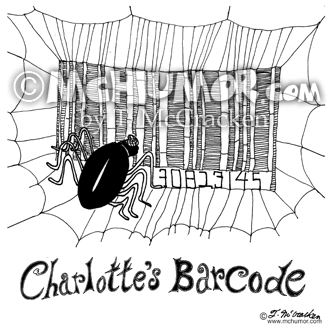 Spider Cartoon 5140: A black widow eats her mate. 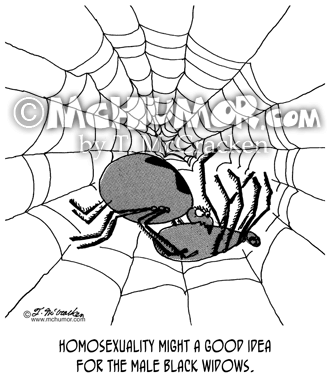 "Homosexuality might a good idea for the male black widows."